This study evaluated a computer-delivered HIV and antiretroviral treatment education program in adults (N = 102) living with detectable HIV viral loads (> 200 copies/mL). The self-paced program provided immediate feedback for responses and financial incentives for responding correctly. The program was divided into three courses and a test of content from all three courses was delivered before and after participants completed each course. Test scores on the content delivered in Courses 1, 2 and 3 improved only after participants completed training on the relevant course. Initial test scores were positively correlated with health literacy and academic achievement; were negatively correlated with viral load; and were lowest for participants living in poverty. Education, academic achievement, and health literacy were related to how much participants learned following each course. Computer-based education is a convenient, effective approach to promoting an understanding of HIV and its treatment. The online version of this article ( https://doi.org/10.1007/s10461-019-02474-z) contains supplementary material, which is available to authorized users. The preparation of this publication was supported by the National Institute of Allergy and Infectious Diseases and the National Institute on Drug Abuse of the National Institutes of Health under Award Nos. R01AI117065 and T32DA07209. All procedures performed in this study were approved by the Johns Hopkins School of Medicine Institutional Review Board. Panel on Antiretroviral Guidelines for Adults and Adolescents. Guidelines for the use of antiretroviral agents in adults and adolescents living with HIV. Department of Health and Human Services, Washington, DC. 2017. http://www.aidsinfo.nih.gov/ContentFiles/ AdultandAdolescentGL.pdf. Accessed 30 June 2018. World Health Organization. Consolidated Guidelines on the use of antiretroviral drugs for treating and preventing HIV infections: recommendations for a public health approach. 2nd ed. Author, Geneva. 2016. http://www.who.int/hiv/pub/arv/arv-2016/en/. Accessed 30 June 2018. Center for HIV Surveillance, Epidemiology and Evaluation. Baltimore City HIV Annual Epidemiological Profile. Maryland Department of Health, Baltimore, MD. 2017. https://phpa.health.maryland.gov/OIDEOR/CHSE/SiteAssets/Pages/statistics/Baltimore-City-HIV-Annual-Epidemiological-Profile-2016.pdf. Accessed 18 Dec 2018. 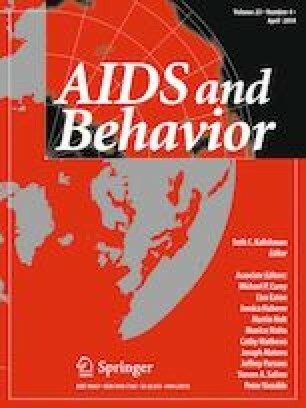 Denning P, DiNenno E. Characteristics associated with HIV infection among heterosexuals in urban areas with high AIDS prevalence-24 cities, United States, 2006–2007. 2010. https://www.cdc.gov/mmwr/preview/mmwrhtml/mm6031a1.htm. Accessed 30 June 2018.